It will be Game On Down Under when Australia welcomes competitors and their family and friends for Invictus Games Sydney 2018 presented by Jaguar Land Rover. Sydney will host more than 500 competitors from 18 nations with around 1000 family and friends for the eight-day event being held from 20-27 October 2018. The Games will feature competition in eleven sports with events being held across Greater Sydney, including Sydney Olympic Park and on and around Sydney Harbour. But the Invictus Games is more than a sporting event - it is a celebration of achievement, determination and resilience. This achievement, determination and reliance will be on show at INVICTUS GAMES SYDNEY 2018 EXCLUSIVE VICTORIA BARRACKS RUGBY DINNER. 10 avid rugby fans have the opportunity to enjoy an unparalleled dining experience in the historic Gallipoli room within the officer’s mess behind the gates of Sydney’s Victoria Barracks. 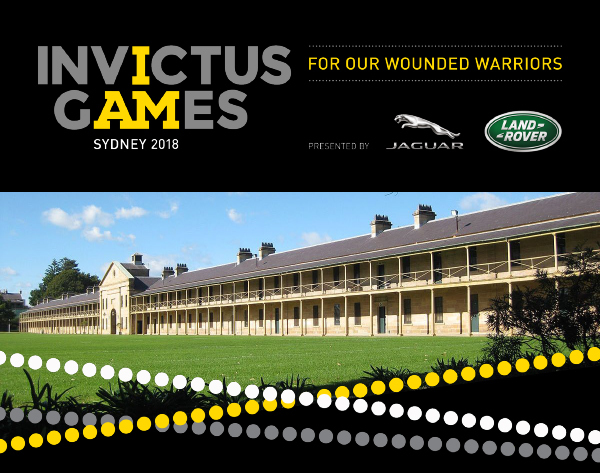 This magnificent event will be hosted by Invictus Games Sydney 2018 Chairman, Lieutenant General Peter Leahy AC (Ret’d), Invictus Games Sydney 2018 Ambassadors Curtis McGrath OAM and Stephen Moore and honoured guest Phil Waugh. On the eve of the Qantas Wallabies versus Ireland game, guests will enjoy an exceptional à la carte dinner inclusive of wines from the heralded Victoria Barracks cellar while their hosts share anecdotes from on and off the field. A silent auction will be conducted on the night providing an opportunity to bid for a once in a lifetime wheelchair rugby experience at Invictus Games Sydney 2018. All proceeds will support Invictus Games Sydney 2018. Invictus Games Sydney 2018 provides an opportunity for long-term impact for the defence community through raising awareness of programs and services in the areas of education, health and wellbeing, employment, adaptive sport and to encourage greater collaboration and co-operation amongst the ex-service and serving community across the generations.